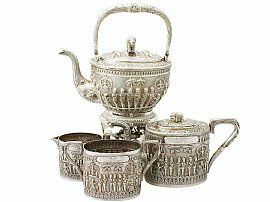 This exceptional antique Indian sterling silver four piece tea service/set consists of a spirit kettle, teapot, cream jug and sugar bowl. Each piece of this service has a oval rounded form. The surface of each piece is embellished with embossed and chased indigenous characters standing holding flags and carrying canopied carriage accommodating dignitary passengers. The decoration to the teapot, cream jug and sugar bowl incorporates an oval cartouche embellished with the contemporary engraved inscription 'R.Chothia to Emma Baird'. The upper and lower portion of each body is encompassed with a stylised leaf decorated border. The spirit kettle and teapot are fitted with domed hinged covers, which retain the original sterling silver elephant finials. The teapot, cream jug and sugar bowl are fitted with sterling silver shaped handles embellished with an indigenous figural ornament, accented with scale pattern to the lower portion and sides. The kettle is fitted with an impressive swing handle ornamented with two elephant heads with a scrolling leaf design to the centre of the handpiece and bifurcating leaf terminals. The fine and impressive kettle is supported on the original four-legged stand incorporating the original detachable spirit burner. The stand is ornamented with a further band of leaf decoration to the upper portion and is supported by four scrolling leaf decorated legs onto elephant feet. The spirit kettle and teapot have exceptional swan necked shaped spouts ornamented with chased elephant head's and trunks. This Indian silver tea service has been independently tested using state of the art technology (Niton XL2 Analyzer) and verified as .925 sterling standard silver. 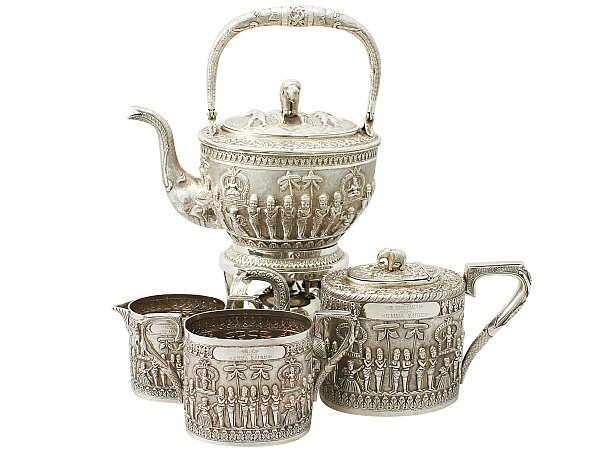 This antique Indian silver tea service is an exceptional gauge of silver, exceptional quality and in exceptional condition. Length from back of body to tip of spout 24cm/9.4"
Length from back of handle to tip of spout 25.2cm/9.9"
Length from back of handle to tip of lip 13.6cm/5.4"